It may sound easy to select and install a fire extinguisher cabinet, but there is a multitude of fire codes and regulations that you’ll need to comply with to meet your local requirements. For starters, a number of locations are subject to the guidelines of the Americans with Disability Act (ADA). These guidelines have specific rules about height, depth, and location of fire extinguisher cabinets. The National Fire Protection Association (NFPA) has over 300 codes and standards for fire protection. The mounting of your fire extinguisher cabinets and extinguishers must follow their guidelines to be in compliance with NFPA standards. Being in compliance can be critical in any insurance claims that may arise from a fire. Your local fire district may have its own specific requirements and, of course, the cabinets must adhere to Florida’s building codes. If you own a boat, you will need fire extinguisher cabinets specifically designed to withstand the motion of the boat caused by waves or weather. Fortunately, All Florida Fire Equipment knows what is required for your location and facility, and has many options for fire cabinets’ types and styles to ensure that you are in compliance with the various regulations. Our cabinets are designed to protect your fire extinguishers from the elements and vandalism while making sure your extinguishers are available for quick and easy use when needed. If you’re anywhere in the Tampa, St. Petersburg, Clearwater, Lakeland, Largo, Sarasota, or Bradenton area just give us a call at 727-525-5950, or email us at service@allfloridafire.com. Or, you can fill out our Contact Us form, and we’ll reach out to you to arrange a time that works best for you. This is by far our most popular cabinet in Florida. You can get cato cabinets that will house either a 5, 10 or 20 pound fire extinguisher. They are great for outdoor applications and they are one of the cheaper fire extinguisher cabinets that we sell. 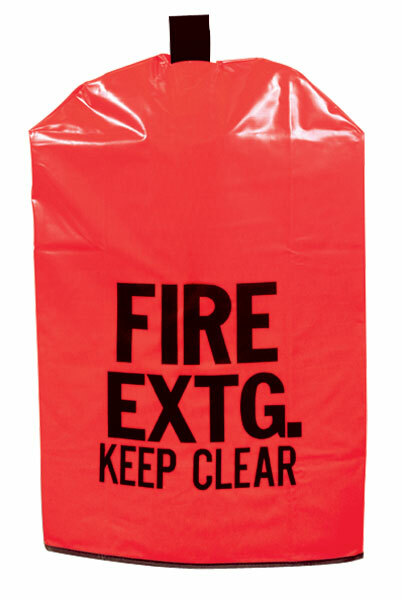 5# 19" 8" 6 3/8"
If you dont want to spend the money on a fire extinguisher cabinet but you still want to protect it these fire extinguisher covers are a perfect option for you. They come in sizes that will fit 5,10,20 pound fire extinguishers. They even make some of these covers large enough to protect the giant wheeled fire extinguishers. 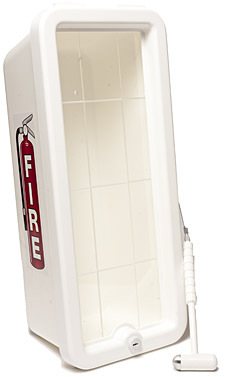 Pictured is the FireTech ABS Fire Extinguisher Cabinet. 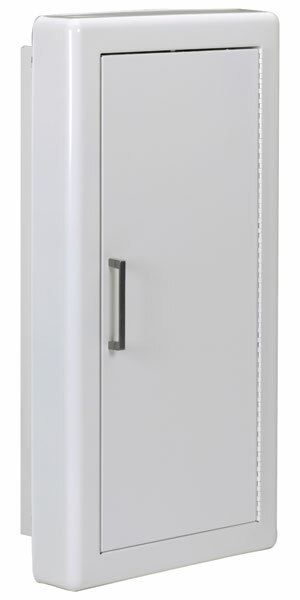 These cabinets are great for protecting your fire extinguisher in harsh weather environments. We have installed many of these cabinets at marina's as the gasket and quick door opening features are perfect for both the hazard that they are in as well as keeping the fire extinguisher protected. MARK Series Fire Extinguisher Cabinets are plastic and are rush and corrosion proof. These cabinets primary use is for outdoor applications. Below is a list of the different types of MARK Series cabinets and there dimensions. M2J Series 21 3/4" 9 5/8" 6 3/8"
MJ Series 18 1/4" 8 1/2" 5 3/8"
M2 Series 25 3/4" 9 5/8" 6 3/8"
We offer a wide range of semi-recessed and fully recessed cabinets. These cabinets come in all sizes, colors and different types of material. We also offer recessed and semi recessed fire hose cabinets. If you are interested in getting some recessed or semi recessed fire extinguisher cabinets give us a call today and typically we can get you a quote within an hour! 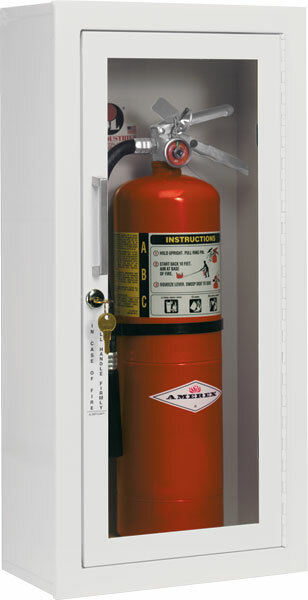 Metal surface mounted fire extinguisher cabinets come in all sizes. These cabinets are good for indoor locations when you cannot recess the cabinet into the walls. While these cabinets are more expensive than your cato fire extinguisher cabinet they do look very class and can be a great touch to add at the end of your construction project. There are some instances that you cannot have a fire extinguisher cabinet mounted but still need the extinguisher to be protected and visible. 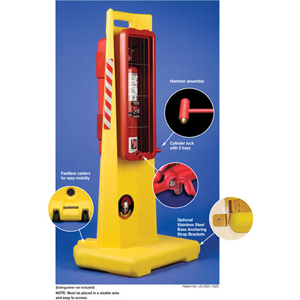 The Centurion Portable Fire Extinguisher Cabinet is your solution. It can fix both a 10 pound and 20 pound fire extinguisher. Give us a call today for more information and pricing.